New Delhi: After training guns on former Reserve Bank of India (RBI) governor Raghuram Rajan and Chief Economic Advisor (CEA) Arvind Subramanian, Bharatiya Janata Party( BJP) MP Subramanian Swamy on Tuesday targeted the Economic Affairs Secretary Shaktikanta Das asking Prime Minister Narendra Modi not to appoint him as Securities and Exchange Board of India (SEBI) chief. 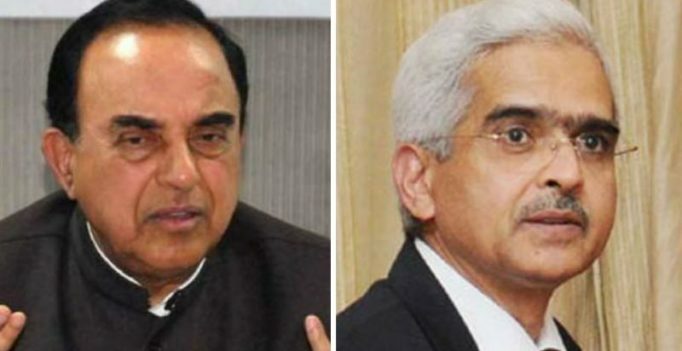 Swamy has written a letter to Prime Minister Modi asking him that the Das should not be made the SEBI chief alleging that he is corrupt and working for former union finance minister P. Chidambaram. Earlier, Swamy had alleged Das of sitting idle to tackle the currency crunch post demonetisation.